This article is about the city. For the district, see Toba Tek Singh District. For other uses, see Toba Tek Singh (disambiguation). 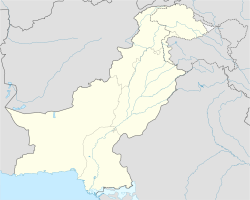 Toba Tek Singh (Punjabi and Urdu: ٹوبہ ٹیک سنگھ‎) is a city and tehsil of Toba Tek Singh District in the Pakistani province of Punjab. The town and district is named after a Sikh religious figure Tek Singh. Legend has it that Mr. Singh a kind hearted man served water and provided shelter to the worn out and thirsty travellers passing by a small pond ("toba" in Punjabi) which eventually was called Toba Tek Singh, and the surrounding settlement acquired the same name. Tahsil of the new Lyallpur District, Punjab, lying between 30°50' and 31°23' N. and 72° 20' and 72°54' E., with an area of 865 square miles (2,240 km2). The population in 1906 was 148,984. It contains 342 villages, including Toba Tek Singh (population,1,874), the headquarters, and GOJRA (2,589), an important grain market on the Wazirabad -Khanewal branch of the North-Western Railway. The land revenue and cesses in 1905-6 amounted to 4.7 lakhs. The tahsil consists of a level plain, wholly irrigated by the Chenab Canal. The soil, which is very fertile in the east of the tahsil, becomes sandy towards the west. The boundaries of the tahsil were somewhat modified at the time of the formation of the new District of Lyallpur"
During the 1970s, when many Pakistani cities were renamed to change names given after British Rulers to their original or native names or more acceptable names to local population - for example, Montgomery returned to its original name Sahiwal - Toba Tek Singh remained one of the very few cities to maintain its original name mainly because of reputation of Tek Singh. In 1982 Toba Tek Singh, formerly a subdivision, was separated from Faisalabad District and became a separate district. Toba Tek Singh is located in central Punjab and occupies 3,252 square kilometres and is made up of large areas of lowlands that flood frequently during the rainy season; the floods originate from the Ravi River that runs along the southern and southeastern borders. The pre-partition T.T. Singh had a sizeable Sikh population, much of which migrated to East Punjab in modern India in 1947. Toba Tek Singh is one of the best producers of oranges, locally known as kenno. It contributes towards export standard quality of oranges produced in all Pakistan. The majority of people living in this district work in agriculture and the region produces several kinds of agricultural and dairy products, including meat, eggs, cotton, maize, several pulses, peaches, guava, tomato, melon, water melon, mangoes, tobacco, onion. She is a celebrated educationist of the district running multiple schools with the name of Al Ain. Mian Hussian (lecturer in English Government Postgraduate College Toba Tek Singh), the only skilled English language teacher in the district who has taught hundreds from the whole district. Abdul Qadeer and Muhammad Hamad are the first citizen of Toba Tek Singh who got admitted in Pieas. "The story of Toba Tek Singh"
"The official homepage of local government Toba Tek Singh."